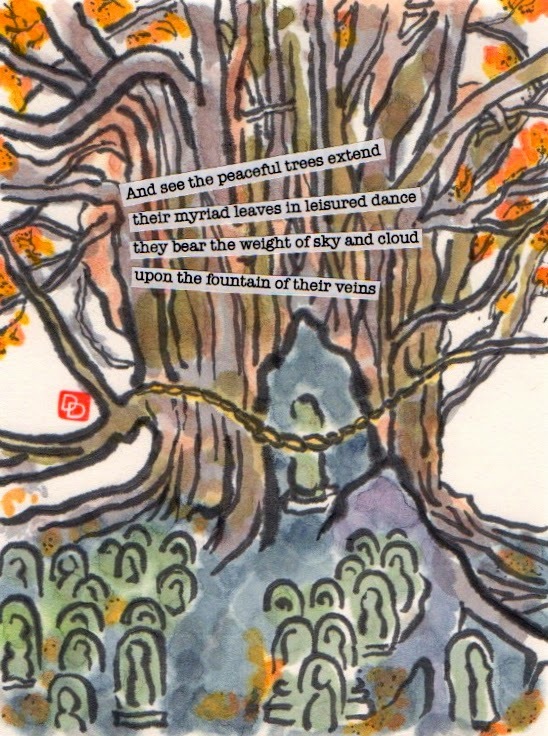 In my Beginner's Guide to Etegami book, I have a section on etegami travel diaries which includes this image of a 700-year old Katsura tree surrounded by Buddhist statues. 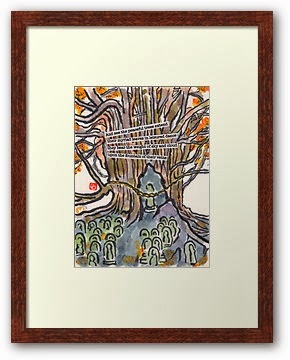 The tree is encircled by an old rope, which marks it as a sacred place. But it was the glow of the fall leaves, both on the branches and on the ground, that persuaded me to linger until I could burn the scene into my memory. When I paint a scene like this, which fills so much of the card that there's hardly any room for words, I often type the words onto a sheet of printer paper, cut them out, and glue them to the card. The typed words in their strips of white provide a contrast to the organic quality of the colorful image, making them easier to read. I separate each line from the others by fanning them out like this to avoid blocking too much of the image and to allow better blending (without getting lost) into the background. 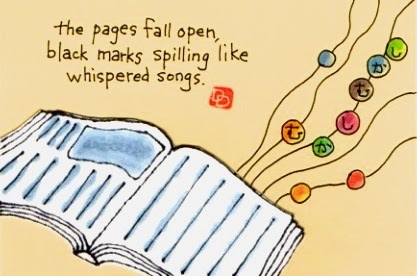 These lines come from the poem Envoi, by the British poet Kathleen Raine. UNESCO recently registered “Japanese Cuisine” as an intangible cultural heritage of the world. 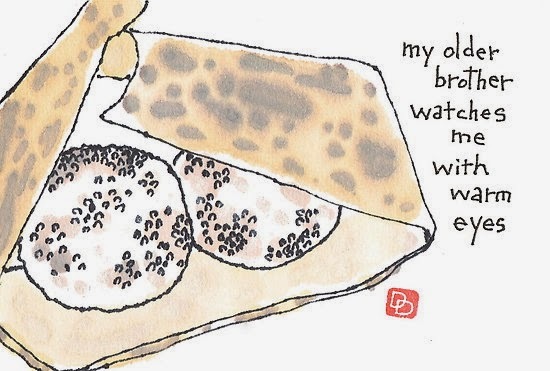 To commemorate this event, I did a series of etegami depicting dishes that I felt expressed the connection between Japan’s food and cultural identity. 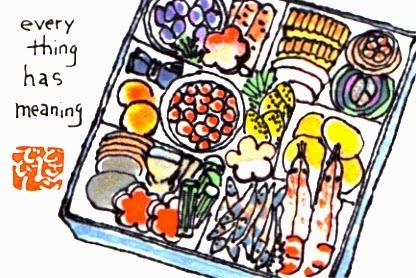 The first illustration depicts a box having lots of compartments filled with a wide variety of tidbits generally called Osechi, which is the label given to food prepared especially for New Year’s Day. Each item has some kind of auspicious meaning, often based on wordplay, although sometimes the significance is in the shape or color of the item. The second illustration depicts Ishikari Nabe, a hot-pot dish that represents Hokkaido, the part of Japan I call home. This Ishikari Nabe features sea food and agricultural produce for which Hokkaido is known (particularly salmon and salmon eggs). 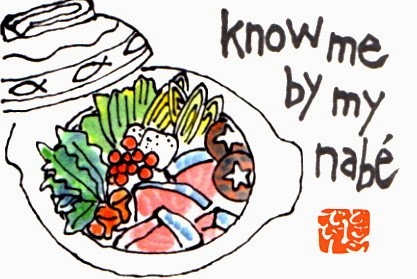 Many regions of Japan are represented by their own particular nabe recipe. I used a black felt pen instead of the traditional fude writing brush and sumi ink for these, so they don't look much like traditional etegami. 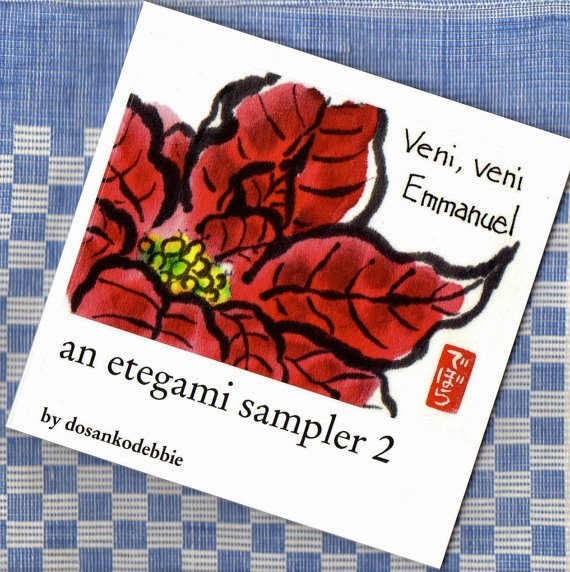 A short story by Kris Kosaka (with my artwork!) 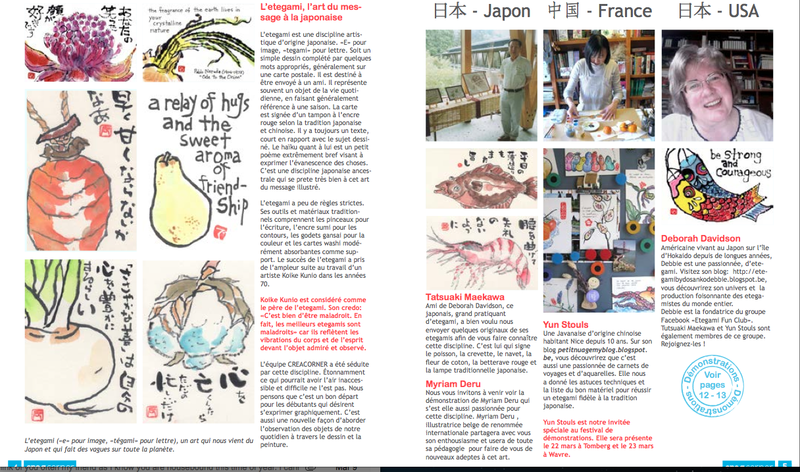 was recently published in the fabulous Kyoto Journal (issue 79). These are the illustrations I did for Dog Boy, a story about an Ainu boy's first day in Japanese public school. Breaking News: Now anyone, even non-subscribers, can access the story at the KJ website. 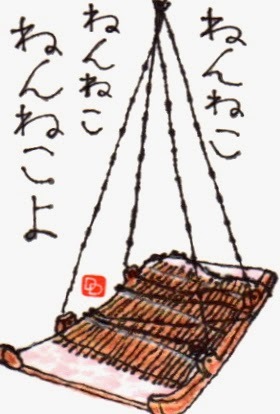 This is an image of an Ainu cradle, called a shinta. The Ainu are the indigenous people of northern Japan. 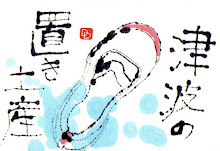 The writing that accompanies the image is from the refrain of an old Japanese lullaby. I sent the original etegami to my writer friend Linda Austin, whose work has inspired my etegami in the past (click here to see related post), but this image is also posted on the Mama Lisa's World website, as an illustration for a series of posts on lullabies from around the world. Mama Lisa' World is chock full of cultural information and fun activities. If you have young children in your life, or you are involved in any way with international music and culture, you'll find lots of cool stuff there. 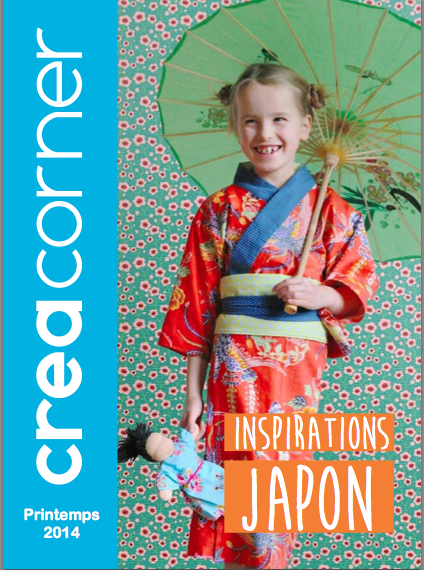 I was privileged to have my work featured in the Spring 2014 issue of the Belgium-based art magazine Creacorner. The theme of the whole issue is Japan as an inspiration for art. 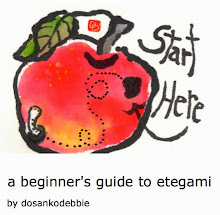 My talented etegami colleagues Yun and Tatsuaki, whose works are frequently posted on my mailart gallery blog, are also featured. Creacorner is bright and colorful-- a true feast for the eyes. You can view the whole issue at this link. 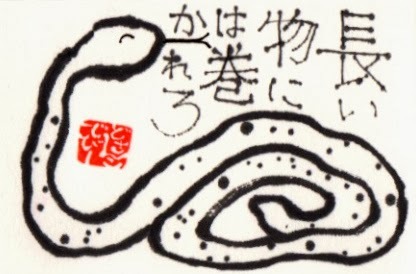 I had an unfinished snake etegami left over from making new year cards for 2013, the year of the snake. 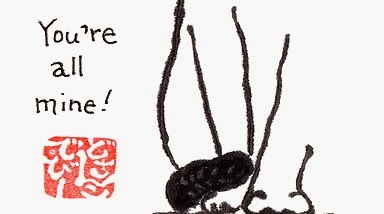 So I wrote the words of a Japanese proverb and added it to my long-neglected Japanese Proverb series. Translated literally, the words say "let yourself be wrapped up by what is long," and it means that the safest course of action is to do whatever the person in power (your boss, for example) wants. It's a proverb I've never illustrated before, because it irritates me. I've decided to leave it uncolored for the time being. 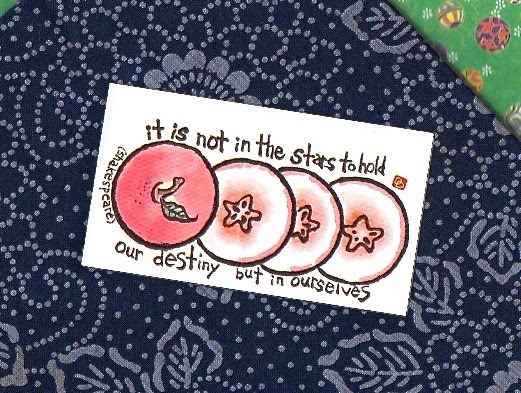 It will soon be on its way to a Postcrosser in the Ukraine. Oops, I just realized the irony of that. Hmm, maybe I'll send it to the Postcrosser in the Netherlands instead. 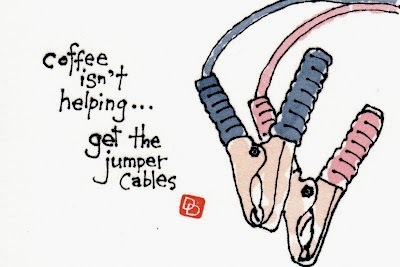 This is a re-post, but nothing could be more appropriate for the way I feel this morning. Argh, Hokkaido winters are just too long. I need new spark plugs or something. when you can't paint, what do you do? So here is what I do when I can't paint: I cut out pretty cards from boxes that various foodstuffs come in. In fact, I never throw away cereal boxes or cookie boxes or tea boxes or bird seed boxes or curry roux boxes (you name the box) without first cutting out postcard-sized pieces of the most interesting or colorful parts of the box. I keep these on hand for all sorts of uses. Like for writing thank-you notes to include with the orders I ship to my Etsy customers. 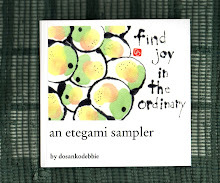 Monday is the day I reserve for sending etegami to shut-ins and people in the hospital or nursing homes. 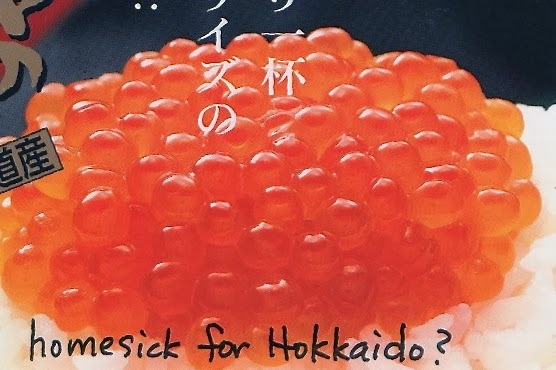 Today, I picked the salmon eggs card for my father, who spent nearly his entire adult life in Japan, but now lives in a nursing home in the US. 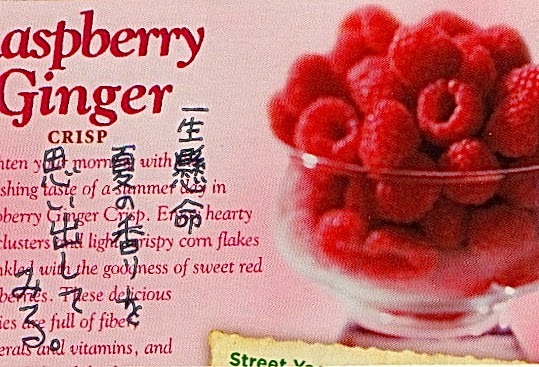 The cereal box card with raspberries are for a sweet Japanese lady in a nursing home in Japan. The handwritten words on the raspberry card say "Trying very hard to remember the smell of summer."